This page attempts to record what is known about the origin and history of the Catherine of Cleves box. Please contact me if you know any of this information is incorrect or if you have any other information that should be added. Thank you. As far as I know this box does not have an established name. I call it the Catherine of Cleves box because it first appears, as an incidental illustration at the bottom of a page devoted to St Agatha, in the magnificent Flemish illustrated manuscript known as the Hours of Catherine of Cleves which dates to around 1440. The box is a fold and cut design and completely unlike anything else that we know of from that date. 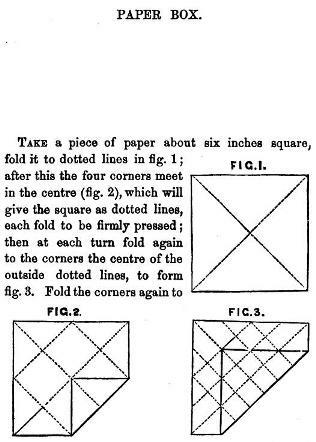 The pictures below show the page as a whole and the detail of the box, pictured in both folded and unfolded form, from the bottom margin. 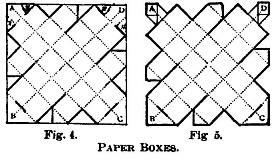 It is not clear whether the box pictured in the illustration would have been made from paper or parchment. Both materials would have been available at this date. As far as I know modern diagrams for this design first appear in 'The Boy's Own Toymaker' by Ebenezer Landells which was published in 1859 by Griffin and Farran in London and Shephard, Clark and Brown in Boston. 'Un million de jeux et de plaisirs' by T de Moulidars, which was first published in 1880 and subsequently republished under the title 'Grande encyclopédie méthodique, universelle, illustrée, des jeux et des divertissements de l'esprit et du corps'. 'Jeux et Jouet du Jeune Age' by Gaston Tissandier, which was published by G Masson in Paris in 1884. In this version slits have been cut in the side of the box so that it can be used as a cage for insects. 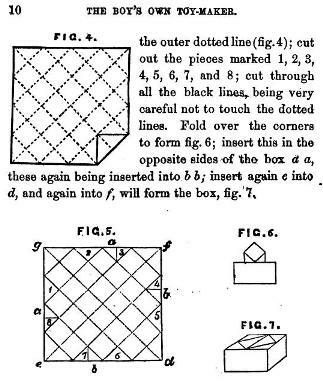 Margaret Campbell's Paper Toy Making, first published in 1936, where the design is called the 'Closed Box'.